With nuggety wicketkeeper Gary Wilson for company, the big-hitting Kevin O'Brien set right the mess he had left Ireland in with some ordinary plans and bowling at the death. Despite their blitz, Ireland didn't finish the match easy. 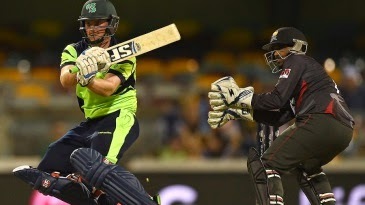 UAE kept scrapping, and by the time it ended Ireland had only two wickets in hand and four balls to spare. Thanks to the first World Cup and second ODI hundred for UAE, 106 off 83 by Shaiman Anwar, and a World Cup-record seventh-wicket partnership between Anwar and Amjad Javed - 107 in 11.5 overs - UAE recovered from 131 for 6 in the 35th over. They defended with passion and precision to have Ireland down at 97 for 4 and 171 for 5, but they wilted in the face of the onslaught from K O'Brien and Wilson, dropping catches, misfielding, some of them walking off with cramps.